What is the difference between wet rot & dry rot? Wet rot and Dry rot have very little in common, only that both are classed as brown rot fungus. Wet rot (Coniophora puteana) is localised to certain areas of a property where there is or has been considerable damp or water ingress and insufficient ventilation. Many older properties were built with wood floors, which were often built into damp walls that are below, or too close to the external ground level. In time the damp progressively rots the the timber. 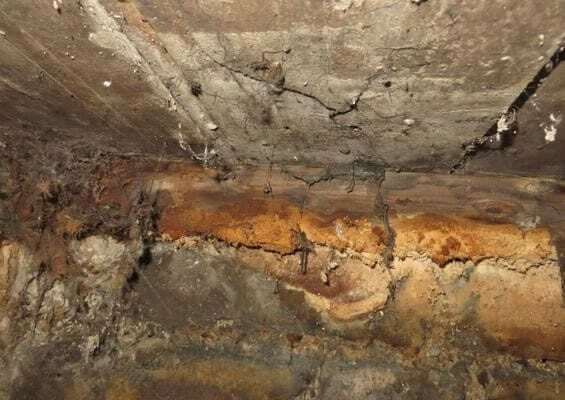 The extent of the wet rot will depend on several factors, including the amount of damp there is, the humidity under the floors and the amount of of sub-floor ventilation there is. Unlike dry rot, wet rot requires very little, if any, preservative treatment. The weakened timbers can simply be removed and replaced with new pre-treated timber, protecting from damp masonry with a damp proof membrane in accordance with good building practice. Sub-floor ventilation should be increased as required and providing everything is done as it should be, the problem will be solved. Dry rot (Serpula lacrymans) is a very different and much more serious problem altogether. It is probably the most insidious problem your property can have, with the exception of subsidence and needs to be eradicated professionally, without delay. Because the mycelium (fungal strands) can spread rapidly, including through masonry, in search of its food source, timber, it can cause considerable destruction to timber it finds, on its way and even spread through the wall into your neighbours property. Complete and immediate eradication by a specialist is very important and will include finding the exact cause of the moisture and repairing it, removing all affected structural and joinery timbers, removing wall plaster, thoroughly sterilising the masonry, preservation treatment of remaining sound timbers, structural and joinery timber replacement, using new pre-treated timber and specialist re-plastering. Compromise for treating dry rot should not be considered. Both wet rot and dry rot restoration are covered by our 20-year guarantee, which can be insured by GPI (Guarantee Protection Insurance). We are proud to be an ISO 9001:2015 quality management certified company, a 5-star Which? Trusted Trader and a long term member of the PCA (Property Care Association). Always do it once, do it right. Common Furniture Beetle (Anobium punctatum) Woodworm, by far the most common of all wood boring insects and attacks, floors, roof timbers, furniture, in fact any timber, inside and out. Wood Boring Weevil (Euophryum confine) Always found accompanying wet, rotting timber, boring along the grain, further weakening the structure. Death Watch Beetle (Xestobium rufovillosum) usually found affecting old, damp oak timbers of houses and churches throughout the country. Some cause more rapid damage than other but all need eradicating. If left untreated they can be highly destructive and ultimately affect the integrity of your property’s structure. Infestations often attack untreated roof and flooring timbers and can spread to other items such as furniture and joinery. The beetles’ larvae (woodworm) bore through the timber and then peppering them with holes as the adult beetles emerge from the wood. Over time, innumerable channels made by the larvae, weaken the tensile strength of the timber, which in extreme cases can cause floors and roofs to collapse and furniture to become brittle and crumble under pressure. 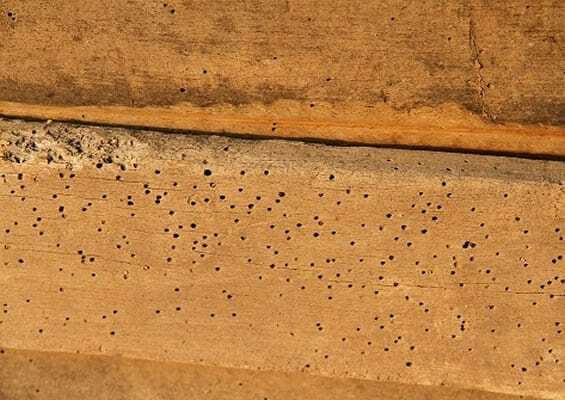 Most of us have seen the tiny (bore) holes left by woodworm, which can be found in numerous places, in both internal and external timber and furniture. These holes are made as the adult beetles bores out, which unfortunately is after the damage has been done. You may see some fine powdery dust (‘frass’) near the holes which if clean, together with the size and shape of the hole, will confirm the type of infestation it is and if it is active. Adult beetles emerge between April and September but treatment can be applied at any time. In Surrey and the surrounding areas, Tapco HomeDry often come across the very destructive House Longhorn Beetle (Hylotrupes bajulus). This insect’s larvae can grow up to 25mm long and as thick as a pencil, rapidly boring up and down the grain of the timber, undetected, for up to 14-years. It often causes serious damage to the structure of roof timbers, which if left untreated can collapse and cost thousands of pounds to replace. If your property is in Surrey or one of the surrounding areas and was not constructed with pre-treated timber, we strongly recommend that you carry out precautionary preservation treatment to your roof timbers, to prevent an infestation of this destructive wood boring insect. Wet Rot is the most common type of timber decay found in buildings and is a general term covering several varieties of Brown or White Rot fungus. It usually occurs because of a building defect or long term Rising Damp. Timbers that are most vulnerable are those that are built into walls, or touching masonry that is damp. Over time they become progressively wetter and slowly soften and decay, to the point of floor collapse. Joinery timbers that are in contact with damp masonry can also be affected and both are considerably aggravated, if the sub-floor ventilation is inadequate or the local water table is high, as this will cause humidity under the floors. Not to be confused with Dry Rot, which is far more serious and invasive, wet rot still needs to be dealt with, before the risk of Dry Rot occurs. What are the signs I have wet rot? The first signs you may have wet rot are a constant damp or musty smell when you first walk into the room, floors ‘springy’ when you walk on them, distorted or cracked joinery timbers and the presence of wood lice or silver fish. If you recognise any of these you are likely to have a problem with damp, which is progressively rotting your floors. To investigate this, floorboards will need to be lifted to inspect the sub-floor timbers, so give us a call to arrange a survey. How do you deal with wet rot? It is important to source and repair the cause the wet rot. Floorboards are lifted to locate the extent of the weakened timbers, which are removed and carefully disposed of. The oversite is cleared of excess rubble and the sub-floor ventilation will be checked and improved as necessary. The remaining sound timbers are then cleaned and treated with a fungicidal/insecticidal preservative, prior to replacing new pre-treated timber, where the old had been removed. Affected joinery timbers are replaced with new, to match existing as closely as possible. Book a damp survey appointment or call us. Damp proofing & timber treatment is carried out by experienced technicians, to the high standards of the PCA.